You will be given a Free reference e-book to read which has 306 pages And the test will be based on that e-book. Understanding all topics related to OCP Oracle8i DBA architecture administrator is essential if you have plans of taking and passing the OCP Oracle8i DBA architecture administrator and backup recovery test. You need to become familiar about all the topics associated to this field so you won’t experience difficulty finding answers to all the questions usually covered in the actual certification test. Among the usual OCP Oracle8i DBA architecture administrator and backup recovery test coverage are the basic steps and procedures involved in the installation and management of Oracle Server, utilization of control files and structures used for both physical and logical databases. You also need to further increase the level of your understanding about storage structures and segments, indexes, constraints and tables management, users and security management, data utilities utilization and recovery processes and structures. Note that you also have higher chances of passing the certification exam if you have a strong background about all the steps associated to the proper utilization of recovery manager designed for recovery and backups, execution of physical backups without the need for recovery manager, using archiving as a means of executing incomplete recovery, utilizing import and export utilities and recovery catalog creation and maintenance. The good thing about taking the useful certification exam is that Brainmeasures is now around to offer a free OCP Oracle8i DBA architecture administrator and backup recovery practice course designed to help you master every topic relevant to the field. Maximizing your knowledge is possible through its free study guide and practice test. One of the most remarkable qualities of the free OCP Oracle8i DBA architecture administrator and backup recovery practice course established and introduced by Brainmeasures to the public is its accuracy and comprehensiveness. This means that with the help of the free study guide included in this free practice course accessible in this well-known online certification company, you will get a clearer idea about all vital aspects and subject areas that are now linked to the actual OCP Oracle8i DBA architecture administrator and backup recovery test. You will get to know more about its vital terms and concepts, major functions and what your roles and responsibilities are once you receive your certificate in this specific field. You will also find the free practice test of this free practice course impressive considering its effectiveness in simulating the actual certification exam environment which is a major help in executing the most vital preparations. 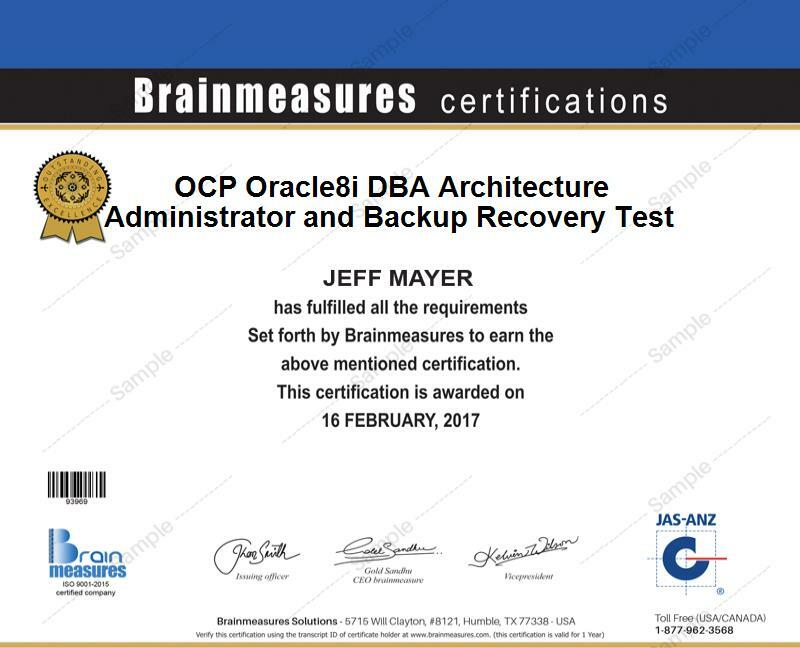 The free OCP Oracle8i DBA architecture administrator and backup recovery practice course established by Brainmeasures can be expected to substantially benefit different types of individuals and professionals. You can expect this free practice course to be useful not only for those who plan to become certified in the field by passing the exam but also to those who plan to become more competent in using the Oracle8i DBA architecture and gather more information about its backup recovery procedures. Earning a higher salary range is also something that you can expect from receiving your OCP Oracle8i DBA architecture administrator and backup recovery certification. Grabbing the position of an Oracle8i database manager will enable you to receive approximately $59,000 to $102,000 yearly. Using your certificate to work as an Oracle8i database architecture administrator also entitles you to earn around $77,000 to $120,000 annually.